The most recent addition to the church, installed in August 2013, is the altar of St. Philomena in the south aisle. The fine neo-Gothic altar was rescued from a closed convent chapel in Scotland and donated by benefactors of the Shrine. Though different in style to the rest of the church, the altar is faced in green marble that exactly matches that of the altar rails of the Sacred Heart Chapel on the other side of the church. The fine Victorian enamel on the tabernacle door at the centre of the altar shows the Pelican in her Piety, a fitting symbol of the Eucharist, since according to the old legend, the pelican nursed her young by piercing her breast and nourishing them with her own blood. 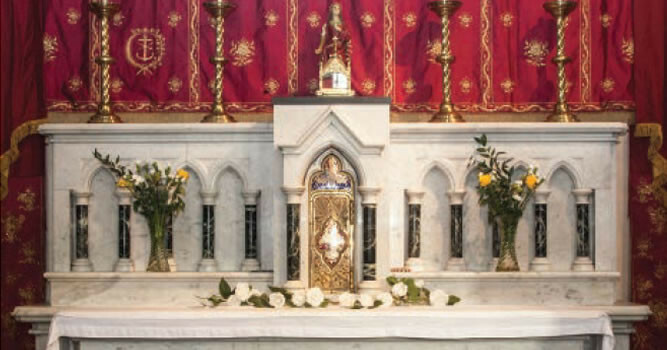 Above the tabernacle is a statue of St. Philomena and a small gilded reliquary containing a relic of this early Christian martyr. The magnificent red silk hangings, part of a set of matching vestments acquired by Fr. Mullins, were reputedly offered as a gift to a church in Portugal by a Spanish shipping magnate. He attributed the preservation of his fleet, caught in a storm, to the intercession of St. Philomena and subsequently commissioned these vestments in her honour. The embroidered anchor in the design alludes to the nature of her martyrdom.